Can You Sink an Orange? 1. Fill the bowl with water. What happens to the orange? 2. See if your friend can get the orange to sink. 3. Take the orange and peel it. 4. 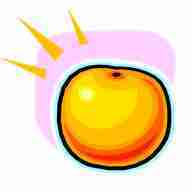 Place the peeled orange back in the bowl of water. What happens this time? The orange sinks because the orange peel if full of trapped air pockets, therefore making the orange light for its size (so it floats). When you remove the peel (including the air pockets) the orange weighs a lot for its size, then it sinks because the orange is denser than the water.